help a troop unload its food collections. On Saturday, Feb. 27, while Saugahatchee District packs and troops “scouted” for food throughout Lee County, Troop 50 Scouts and leaders assisted the Food Bank of East Alabama by unloading, weighing and sorting food donations as they arrived at its warehouse. This year marked the third year the troop provided warehouse support for the annual Scouting for Food drive. 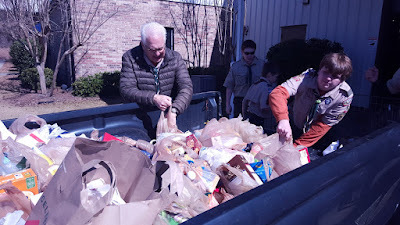 Scouts worked in teams to unload vehicles ladened with food donations as they arrived at the Food Bank. Carts, once filled, were weighed so units would receive credit toward the competition for the district’s traveling Scouting for Food trophy. Scouts then rolled the carts to the sorting area so food could be placed in one of four categories: canned food, cookies, crackers, and other items. 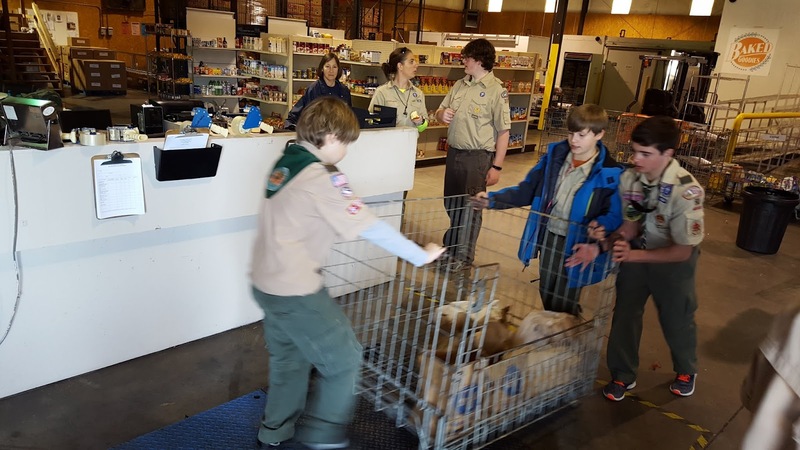 The troop helped unload and sort 6,564 pounds in donated food — and logged a collective 57 hours of community service — as part of this year’s Scouting for Food drive. Food Bank volunteers will further sort these food donations as they help distribute them to the Food Bank’s 190-plus partner agencies: emergency food pantries, shelters for the homeless, soup kitchens, special residential facilities, low-income day care providers, after-school programs, and shelters for abused women. Last year, the Food Bank distributed 4.5 million pounds of food through its partner agency network, which helped to feed approximately 149,000 low-income east central Alabama residents. For more pictures from Scouting for Food, visit the troop’s online photo album.